Social networking may be able to reduce loneliness and increase well-being for older adults. This project explores the impact of computer use and social networking on quality of life. People who have meaningful relationships experience a higher level of well-being. Older adults may have a hard time starting and keeping relationships with others due to many different factors in their lives. Without these relationships, older adults may feel lonely which may lead to other negative impacts on their health and well-being. Online social networking may be a new solution to this growing problem. 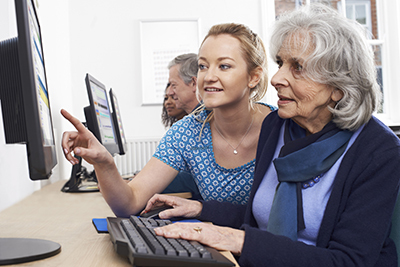 Many older adults do not know where or how to start using an online platform such as Facebook. This study looked at how a program designed just for older adults can create more social connections and increase overall well-being. encourage online interactions. There was also a control group with no added interactions. The results of this study revealed that participants in both weekly technology training groups showed increased life satisfaction, overall feelings of competence, and positive attitudes towards computers over the course of the 2-month study. Additionally, developing a sense of connection with others in the newspaper club was positively linked to life satisfaction and cognitive functioning at the end of the study. These findings suggest that technology training groups may be an effective way for older adults to become more comfortable using computers for social interactions, and that the benefits of these groups may extend to overall improvements in mental health. Identifying with others in a social group (e.g., newspaper club) likely encourages greater life satisfaction and cognitive health as well.